Let a fully qualified Danish translator and language consultant translate your documents from English and German into Danish or translate your text from Danish into English. By choosing a Danish mother tongue translator to handle your translation into Danish you are making a positive choice of quality in the translation. Keep in mind how important flawless communication is between you and your reader, be it your customers, overseas colleagues, students, etc. By choosing a professional Danish translator you avoid errors of grammar, spelling, and unsolicited amusing phrases, all of which may shift focus from the message that you wish to convey. An example of what it is that you achieve by choosing a Danish native speaker over a translator who is not a native speaker and who makes use of machine translation can be seen below. 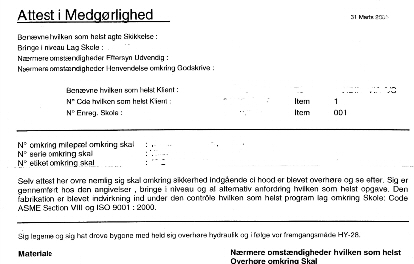 The picture shows a document which was sent to a Danish engineering company and which had obviously been processed by Google translate or similar. If it was meant to be the laugh of the day, it was a success. However, the Danish company had to contact the sender and ask for the original document which turned out to be a Certificate of Conformity. You may also want to consider the bilingual content of your company website which is often the platform where your potential customer reads about your company and what you have to offer, be it goods or services. A professional translation by a Danish native speaker will present an image of quality whether you want to publish a presentation on your website, a flyer or maybe the company profile brochure where you introduce yourself and your products to your customers. When you send us an enquiry, you will usually receive a quote within 24 hours.